Samsung Electronics Singapore today announced its partnership with Citibank Singapore Limited for Samsung Pay, the secure and easy-to-use mobile payment service that can be used to make purchases almost anywhere1. Upon the service’s launch in Singapore, Citibank credit cardmembers will have the option to make payments across Singapore using their compatible Samsung mobile phones2. The partnership marks a new addition to Samsung Pay’s extensive portfolio of major payment networks and banks, to provide greater flexibility, access and choice for customers in Singapore. The partnership between Citibank and Samsung Pay is a win-win collaboration for both parties. Samsung will be able to leverage on Citibank’s extensive customer base and merchant network to promote greater adoption and usage of digital payments in the country while Citibank’s credit cardmembers using compatible Samsung phones will enjoy greater convenience in the payment process. With their digital wallets, Citibank customers, who are increasingly digitally-savvy, will truly benefit from being able to pay on the go, wherever they are, and whenever they want. Ahead of its launch in Q2 2016, a select group of consumers has been invited to register their participation in the beta testing for Samsung Pay. They will be among the first to preview the company’s flagship mobile payment service in Singapore. Response from consumers is encouraging, with thousands who have signed up. Registration has now closed and eligible consumers will be notified progressively ahead of the Samsung Pay Beta Test Program. Samsung Pay will be available to users of the Samsung Galaxy Note 5 4G+, S6 edge+ 4G+, S7 4G+ and S7 edge 4G+ in Singapore. A secure and easy-to-use mobile payment service, Samsung Pay can be used to make purchases almost anywhere1 that credit and debit cards are accepted. SIMPLE: With Samsung Pay, every transaction is made super easy. You simply need to swipe up to bring up the last transacted credit or debit card, scan your fingerprint or key in your PIN and make payment. SAFE: With each separate transaction, Samsung Pay uses an encrypted digital token to replace sensitive card information to prevent fraud. Your payment information is better protected than ever before. Transactions made on Samsung Pay require registered fingerprint or PIN for authorization, so you are in control when each payment is made. The encrypted fingerprint information is stored in a separate, secure area of your device. Samsung’s industry-leading KNOX security platform, which received the most “Strong” ratings of any mobile security platform for Corporate Managed Security3, provides real-time kernel protection and monitors malicious software and activities on your device for added security. ALMOST ANYWHERE1: Samsung Pay is accepted almost anywhere you can swipe or tap your credit or debit card. By incorporating Samsung’s proprietary Magnetic Secure Transmission (MST) technology, together with Near Field Communication (NFC), Samsung Pay will be compatible with the majority of existing and new payment terminals, allowing users to pay with their compatible Samsung smartphone almost anywhere. Availability almost anywhere is based on compatibility of Samsung Pay on MST and/or NFC payment terminals, with some supported for use only after software upgrades. 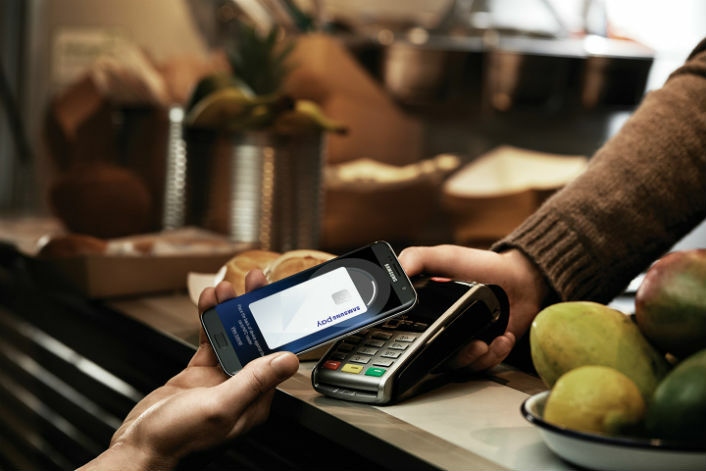 Samsung Pay is exclusive to selected Samsung Galaxy smartphones only, and available across all participating payment networks, banks, and merchants. Availability may vary, please check for updates. Samsung Pay will be available on the Samsung Galaxy Note 5 4G+, S6 edge+ 4G+, S7 4G+ and S7 edge 4G+ at launch.